Don’t go another year not knowing if your landscaping business is making you as much money as it could. 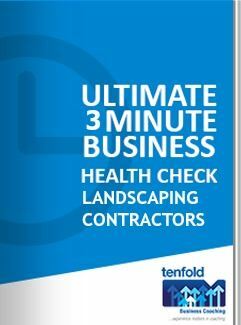 Leading landscape construction contractors trust Tenfold Business Coaching to deliver real results that matter: Profit, Cash Flow, High Performing Team. Learn How Brocor Increased their Profit x3 in 18 months! How Does Your Landscaping Business Stack Up? As a landscape contractor, you might think your business is going well. And maybe it is. But how do you really know if your business is performing as well as it could? Find out how your landscape construction business stacks up – the results may surprise you. Be on top of the important numbers in your business. Know how your landscaping business is performing in all areas. Proven systems and processes to ride the bumps. Achieve long-lasting success for your landscaping business. Have a handle on the key drivers of your business – cash flow, sales, suppliers, costs, productivity, resources. We have a medium-sized landscaping business, running 16 people. When we started working with Tenfold it was a crucial time for us because we had to change, but there was no direction. We knew how to get the jobs done and make money, but after that we were at a bit of a loss as to what’s needed to run a great business. The biggest benefit to coaching has been having the confidence to grow without stressing about how to do it. Our Tenfold business coach has put a lot of order into the business, which was hard for us because we’re not that way inclined. We look at the business differently now. We’ve grown from four to 16 people. Before, we wouldn’t say no to anything. Since then, we’ve changed our market and now we choose our jobs. We drive past other tradesmen now and think, wow, they have no idea. We’ve come so far, with all the systems and having everything run itself. 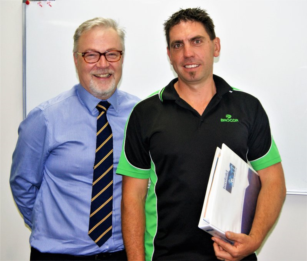 We’re setting up a business to run, and that’s completely different to being a tradesperson. That’s our goal – to make this place turnover while we’re not here. Call Tenfold’s Practice Manager, Tania, on 9813 8777 to arrange a complimentary consultation with one of our experienced business coaches.